Almond/Pistachio grower Wonderful Orchards' Brad Higbee discusses NOW impacts. Also pictured is pistachio grower Ted Sheely. Responding to a request from the Western Agricultural Processors Association, representatives from USDA Agricultural Plant Health Inspection Service (APHIS) –Plant Protection and Quarantine (PPQ) conducted a meeting with industry representatives in Phoenix, Arizona this past week to discuss the investigation into applying Sterile Insect Technology (SIT) to Navel Orangeworm (NOW). Currently, USDA APHIS PPQ operates a rearing facility in Phoenix that raises pink bollworm (PBW) moths which are sterilized and released over cotton fields in California, Arizona, New Mexico, and Texas. What once began as a “suppression” approach to help bring down numbers, it has combined with other tools, including mandatory plowdown restrictions, Bt cotton, and pheromone rope to the point of near eradication. In fact, no native moths have been found in these areas for almost three years! The tree nut industry has expressed an interest in determining if this type of technology can be applied to NOW in the hopes of suppressing large numbers of NOW, in conjunction with other technologies and pest management strategies. The pistachio industry, led by WAPA member Jeffrey Gibbons of Setton Pistachio, has already rallied behind the effort and has pledged up to $1 million in research funds to kick off the effort to determine whether or not it will work. The contingent from USDA APHIS PPQ was led by Deputy Administrator Osama El-Lissy. 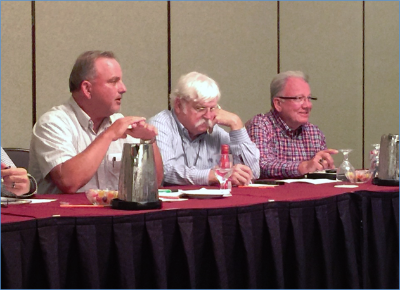 Action items from the meeting with USDA APHIS PPQ include the formation of a NOW Action Committee and a cooperative agreement with USDA to carry out this research.